Amongst the surprises contained in the 2011 Census statistics on travel to work are some encouraging and some challenging findings for supporters of ‘smarter choices’ and sustainable transport more generally. First some good news: across the country as a whole, the share of commuting by car has fallen, slightly. London continues to show the rest of England how modal shift from driving to public transport can be achieved. Apologists for deregulation used to argue that London’s buses were only succeeding because of big public subsidies. There was some truth in that argument a few years ago, but subsidies have fallen dramatically in recent years, and yet bus use in London continues to rise (see TfL’s latest annual report). Meanwhile commuting by bus has declined in all eight of the Core Cities, by 13.7% on average, since 2001. In my home city of Bristol, critics of the Cycling City programme have been confounded by a two-thirds increase in the modal share of cycling. London has also seen a similar increase in cycling, but from a lower base. High rates of cycling are concentrated in a few Inner London boroughs plus the one outer borough of Richmond-upon-Thames. More worryingly, the three Sustainable Travel Demonstration Towns (STDT) Darlington, Peterborough and Worcester have all bucked the national trend, registering increases in the share of driving to work. The English STDT programme which ran from 2004 until 2008 was one of the biggest smarter travel experiments conducted internationally. Each of the three towns took a slightly different approach, but area-wide personalised travel planning was central to all of them. The evaluation study commissioned by the DfT (Sloman et al 2010) concluded that the programme had been a success, with car trips falling by 9% across the three towns, mainly due to modal shift. LTT readers may remember the controversy last year about the DfT’s treatment of smarter choices in its WebTAG guidance (Issue 598). Implicitly repudiating the findings of its own study, the DfT’s modellers opted for scepticism, downplaying the likely impact of smarter travel measures. This prompted the Campaign for Better Transport to publish alternative guidance, using more optimistic assumptions consistent with the various evaluation studies. Central to that debate was a difference of opinion about the reliability of ‘before and after’ evaluation studies. Many studies worldwide have attributed significant changes in travel behaviour to smarter choices (or ‘Voluntary Travel Behavior Change’). Most of these have relied heavily on before and after surveys. An influential strand in the academic literature has questioned the reliability of such methods. However carefully the data is collected, the responses may be vulnerable to several types of bias, particularly social approval bias and differential response bias i.e. those people who have a positive change to report are more likely to respond to a survey than those who feel the whole thing has been a waste of time. Face to face collection methods may minimise the latter, but increase the risk of social approval bias. These problems may afflict survey-based evaluations of any transport change, but those involving social marketing are likely to be particularly vulnerable: more so in the ‘after’ surveys than the ‘befores’. As the evaluations are generally trying to measure small differences between two larger figures, even a small bias can significantly skew the results. It is easy to demonstrate some of these biases in laboratory situations but how significant are they in practice? This is a difficult question to answer: it would require a comparison between survey responses and “the right answers” obtained by other, more ‘objective’ methods. Traffic flows are often measured as well and they usually ‘tell a different story’. In the STDT evaluation the traffic counts showed smaller reductions than the surveys suggested. The authors attributed these differences to a range of local factors such as population growth and differences between local and externally-generated traffic. Other studies worldwide have referred to issues such as weather conditions on the data collection days. As the surveys and traffic counts are not measuring the same things, it is difficult to say with any confidence whether the survey measures are telling a true story or not. The STDT evaluation showed relatively small changes in commuting by residents of the three towns. The modal share of driving fell by 3% in Darlington and Peterborough, with no change in Worcester. In estimating the cost benefit ratios of the STDT programme, Cairns et al estimated that the effects of the changes would ‘decay’ at a rate of 40% a year once the programme finished, so we wouldn’t expect much effect to remain by the time of the Census. Many other factors could have contributed to those increases in driving, which might have been greater if the STDT had never happened. But the simple fact that driving went up may, nonetheless, strengthen the hand of the sceptics in the DfT and the Treasury. The English STDTs were followed by similar programmes in Scotland and most recently in the Republic of Ireland, where implementation began in Limerick, Dungarvan and Westport last year. UWE was part of a consortium led by Irish consultants Transport and Innovation, which bid for the evaluation of that 5 year programme. The tender feedback showed that we scored highly on methodology but narrowly lost out on price (a familiar experience to any of you?) Amongst the ideas we proposed in that tender was one which could have helped to resolve those lingering uncertainties about the reliability of before and after surveys. Academics sometimes jealously guard their untried ideas, but as we didn’t get the chance on that occasion, I would like to hear from anyone who might be interested in trying the following idea in a real situation. This could relate to smarter choices or any other change in travel behaviour over time. The first step is to identify self-contained networks of residential streets, where all movements in and out can be measured by trip counters or manual observations. Most towns and cities do have such areas, like the ones below which we identified in Dungarvan. Their populations may not be typical of the whole town, but that does not necessarily matter. Within those areas a higher concentration of households will be asked the same questions as households across the rest of the town. These must ask about visitors and deliveries as well as trips by household members. 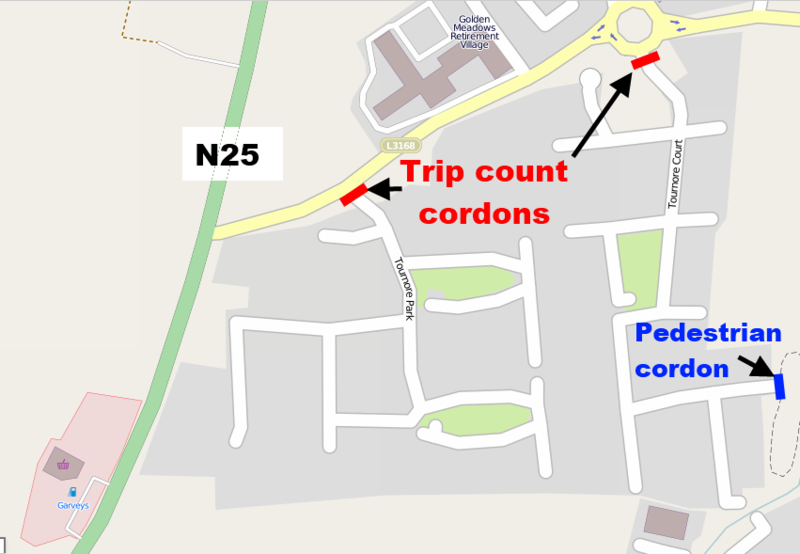 The traffic counts should cover the same time periods as the survey responses, so self-reported trips can be compared to the traffic movements. The two measures are unlikely to yield exactly the same results. If we assume the trip counters measure ‘actual trips’, the key question is whether the ratio of reported to actual trips significantly changes between the before and the after survey. If it does, then adjustments can be made to the findings for the whole town. The devil is often in the detail when designing a research study: there would be several practical challenges, but none of them seems insurmountable. Which modes can be compared in this way would depend on the trip recording methods: even if limited to cars and delivery vehicles, it could still help to verify the validity of the survey. Accurately measuring behaviour change is one challenge. Explaining the causes is a tougher one. Why was the Cycling City in Bristol apparently so much more successful than the STDT programme? It would be interesting to hear the views of transport planners working in those three towns. A number of studies are looking at different aspects of cycling in Bristol, which may reveal more. In the meantime, some more general, and fundamental, comments can be made. The Cycling City programme in Bristol spent considerably more on infrastructure than marketing. It accelerated a programme of cycle route construction already underway, which is continuing in several places across the West of England area at the moment. Much of the marketing effort was aimed at promoting these routes, which have gradually joined up to create one of the most comprehensive radial networks of any British City. From where I live in the Centre, I can now leave the city on cycle routes in six directions: not all off-road, but joined-up and avoiding heavy traffic. The design quality is variable – Copenhagen or Groningen it ain’t – but the network has created many useful short-cuts for cyclists and pedestrians. For all its faults, I have watched a growing number of cyclists and pedestrians using these routes, particularly at peak times: the trip counts on one of the most improved routes doubled during the Cycling City programme. Some of the marketing did help spread awareness of these routes, though much still remains to be done in that respect. Part of the credit must be given to First Group, for pricing people off their buses (recently acknowledged with a ‘fares consultation and review’ launched under political pressure). But the fall in bus use is only part of the story: walking has increased and car driving has also fallen. Congestion is a problem for cars and buses, but a long-standing one: average traffic speeds have been increasing in recent years. And I have witnessed the growth amongst certain segments of Bristol’s population of a ‘cycling culture’. As one participant in a focus group put it: “cycling is not seen as bizarre in Bristol”. Several analysts of cycling in Northern Europe (e.g. Pucher, Buelher, Hembrow) have described how cycling cultures have developed in countries and cities where sustained improvements have been made to cycling infrastructure. To prove what caused what (or calculate meaningful cost-benefit ratios) would be impossible, but to surmise that each reinforced the other is probably a safe bet. There is a broader lesson here for smarter choices and modal shift. Social marketing can help to foster, or accelerate transport cultures of one kind or another. But marketing is about more than information or persuasion: it is also about the nature of the product itself. Marketing a useless product is a waste of time and money. Fostering cultural change where conditions are improving is the only way smarter choices will work in the longer-term. If commissioners of research are interested in achieving value for money, rather than simply estimating it, then understanding how to foster those changes would be more useful than obsessing about cost-benefit ratios for measures which may be impossible to disentangle.